Cold Sterilant, is a reagent grade peracetic acid solution (also known as peroxyacetic acid or PAA). PAA is an organic compound in a colorless aqueous solution. Altacare ® is EPA approved. Altacare ® is a powerful broad spectrum disinfectant against bacteria, virus and spores. It is highly effective against a broad range of microorganisms, due to its high oxidizing potential. Altacare ® stops organism growth by oxidizing microbial enzyme systems and cell proteins. Unlike disinfectants like aldehyde, chlorine, and heavy metal / silver impregnated disinfectants, Altacare ® has minimal impact on the environment. 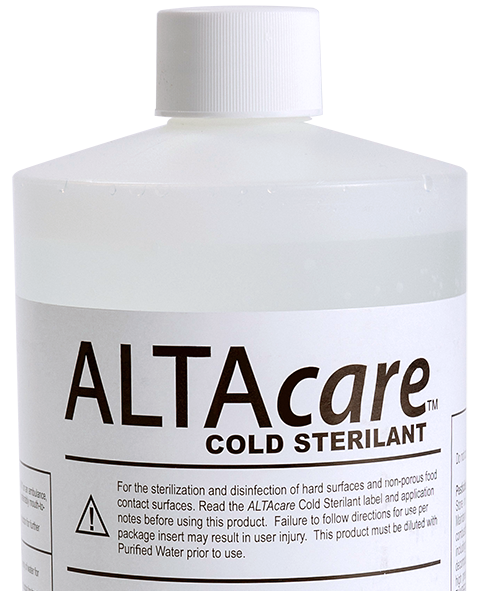 Altacare ® Cold Sterilant is also fully biodegradable and environmentally friendly (green), and it decomposes and dries into safe and environmentally friendly components of: water vapor, oxygen, and acetic acid (vinegar) vapor. The result is residue-free treated surfaces. Only pharmaceutical quality raw ingredients are used to manufacture Altacare ®. This choice of quality ingredients eliminates the introduction of undesirable materials into treated areas like clean rooms, pharmaceutical processing facilities, and food processing areas. For over 20 years, Altacare ® PAA chemistry has been utilized in hospitals and clinics. In addition, it is registered for use in locations such as but not limited to: industrial laboratories, hospitals, medical product manufacturers, pharmaceutical manufacturers, bio-tech companies, and food & beverage processing plants. * Note: Hydrogen peroxide is very low at only 0.88%, when mixed and applied by the AP-4. Each bottle of Altacare ® can treat approximately 15 standard sized patient rooms, when using Altapure’s AP-4 ™ high-level disinfection system. Why Select Altacare - PAA agent? - Manufactured from pharmaceutical quality raw ingredients. - Filtered through 0.2 micron filters. - Very rapid spore kill. - Approved for use in clean room industry. - 20+ year successful track record in hospitals. - No heavy metals (like silver). - Registered with the US Environmental Protection Agency (EPA). - Powerful broad spectrum disinfectant. - Registered claims as Sterilant / Sporicide / Bactericide / Fungicide / Virucide. - Compatible with all common hospital and clean room surfaces. - Decomposes and dries into water, oxygen, and acetic acid (vinegar) vapor – no residue & ends green. - Post treatment light smell is acceptable to burn units and cancer wards. - Easily disposable and biodegradable. * Click here to learn more about: “Test Results & Efficacy“. * Please click here to learn more about: “Aerosol Liquid & Process Safety“.